(Newser) – This is your brain ... on traffic fumes? 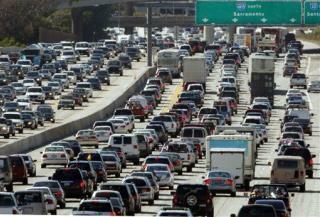 A growing body of research suggests that fumes from traffic jams can damage the brain, as well as your lungs. Exposure to exhaust has a negative effect on brain power and emotional stability, and while the evidence is largely circumstantial, researchers tell the Wall Street Journal it's enough to cause real concern. One study released last year found that children born to mothers living near freeways in Los Angeles were twice as likely to develop autism. When I moved from Ohio to California, I thought I would meet intellectual, artistic, enlightened people. What I met in Ontario, I-10, Rancho Cucamonga I-210, Riverside I-15 were some of the dumbest individuals, I have ever met. I did meet some really intellegent people above the smog level on Mt. Baldy. So now I know, back to my bong. For many years the government has been working to lower emissions. Do they know something the scientists are just now beginning to realize. Where have they been? As a child I suffered from diesel exhaust from city buses in Seattle. I remember headaches and temper tantrums after riding the buses to go shopping with my mother. It was horrible. Just more proof we need to get off oil altogether, not drill for more.